Germany had tried to execute Sea Lion, the invasion of Britain. Admiral Raeder’s Mediterranean strategy had been adopted and the British position in the Middle East had crumbled. Russia had been prepared for the German attack. “General Winter” had not come to the aid of the hard-pressed Russian armies in late 1941. The European Axis and Japan had cooperated in implementing a strategy aimed at destroying the Western Allied lines of communication in the Indian Ocean. 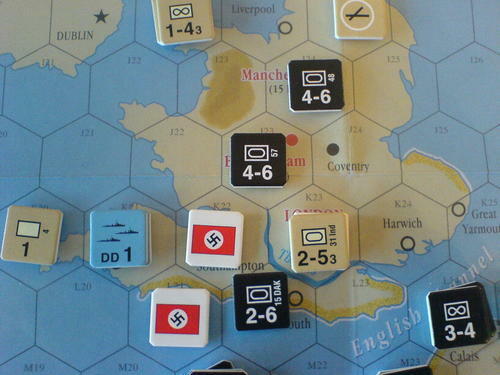 The Battle of the Atlantic had been won by Germany. War had broken out between Russia and Japan in 1941 or 1942. Japan had avoided disaster at Midway in 1942 and instead invaded Australia or India. Japan had knocked China out of the war. the U.S had mobilized more armor units and fewer air units, or more infantry and less armor, or ? 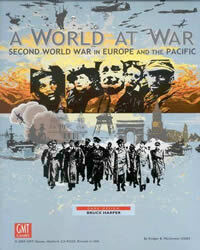 the Western Allies had tried to invade France in 1943 or earlier, leaving Italy for later. The Western Allies had failed to develop the atomic bomb - but Germany had. the Western Allies had developed jets or rockets. YOU had been in command. named ships, allowing players to sink (or lose!) the Bismarck, Yamato, New Jersey and other famous ships. naval construction rules which allow major powers to build the navy they think will suit their strategic requirements. mobilization rules which allow major powers to tailor their army and air force pools to meet their needs - provided they anticipate them accurately. oil rules which force the Axis to worry about their inadequate oil reserves even when victory is within their grasp - although Britain and Russia can have cause for concern as well! simplified diplomatic rules which allow minor countries to align themselves with various major powers. more intuitive Combat Results and Attrition Tables. 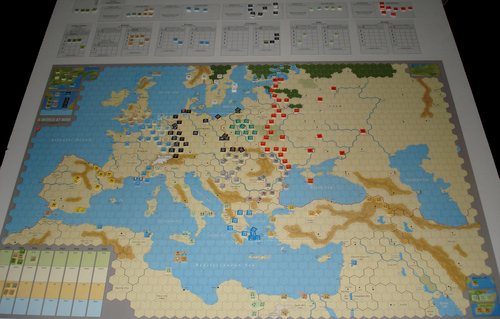 additional terrain on both the European and Pacific mapboards. 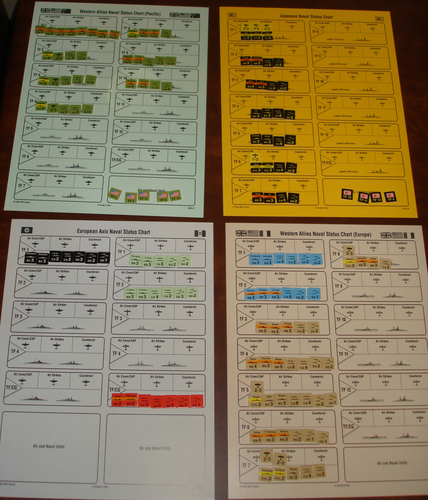 new counters for beach defenses, partial supply and island group control. 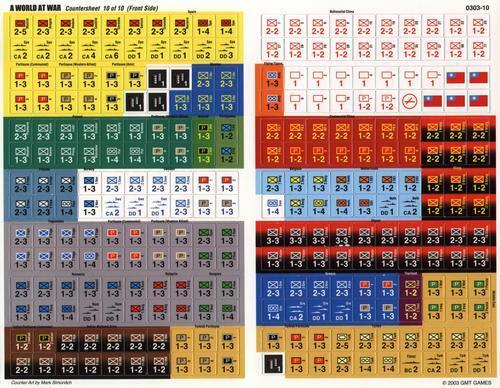 revised counters based on feedback from A World at War players. rules changes to mitigate the effects of bad luck, especially early in the game, leaving it to the players themselves to ruin their positions. improved submarine warfare and strategic bombing rules. more realistic raider and naval combat rules. more realistic implementation of the “big three” high technology research projects: jets, advanced submarines and rockets. increased balance between the western, Mediterranean and eastern fronts. graduated economic growth rates and a link between Germany’s conquests and its construction rate, so that an Axis “Fortress Europe” strategy is as risky as any other. modified atomic research rules which preclude ahistorically early atomic bombs, while still leaving open the possibility of a German bomb. 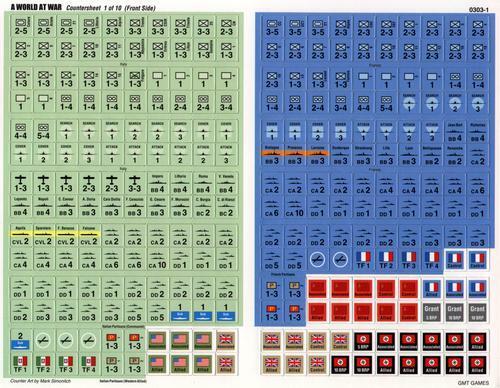 an enhanced Japanese Resistance Table, with Japan getting credit for expansion beyond its historical achievements.